Following immediately from an account of Edward's life, a series of stories tells of miracles that occurred at his tomb in Westminster Abbey. 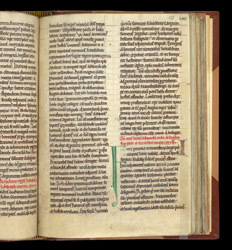 The text on this page starts near an account of how, with St. Edward's aid, Harold achieved victory at the battle of Stamford Bridge (mentioned in the 13th line of the second column). The initial 'F' which follows introduces an account of a blind man whose sight was restored after having a dream in which Edward rose from his tomb.